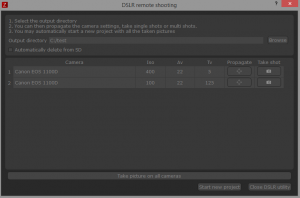 From 3DF Zephyr 2.650 onwards, the DSLR remote shooting functionality has been added and can be found in the Utilties Menu. An additional download of the following plugin is required. This feature is still to be considered experimental and supports Canon DSLR cameras only. If you encounter issues with your setup, please get in touch either on the forum or at support@3dflow.net describing your setup and your issue. 3DF Zephyr Lite and 3DF Zephyr Lite Steam Edition support up to two connected DSLR cameras. 3DF Zephyr Pro and 3DF Zephyr Aerial support up to the physical USB connection limit (see physical setup notes). Please note that in most configurations, a delay of roughly 100ms per camera is added when doing a synchronous multi shoot when initiating the command via software. If synchronization is important, consider using other tools (i.e. a wireless device) to initiate the image acquisition. After you have installed 3DF Zephyr, simply run the plugin installer and check the 3DF Zephyr installation directory (if it’s not detected automatically) then follow the instructions on screen. Although theoretically Zephyr could handle a number of cameras that is limited by the physical USB ports available, it is advised to limit to 16 cameras for notebooks and 32 for desktops. Please also remember that USB cables should not be longer than 5m and if possible avoid using USB hubs. Please also remember that with the current version some settings cannot be controlled via 3DF Zephyr and have to be setup accordingly on each camera (white balance, quality, etc.). 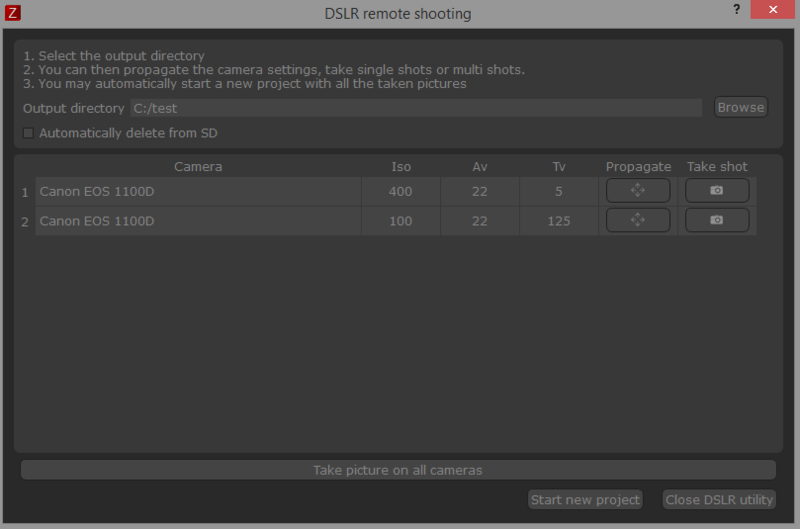 Right now the only settings that can be propagated from one camera to all the others are ISO speed, Tv and Av.